Shown here: 19th/north 10, June 10, 2007. Pieces by CUBA, KING157, JELOE, π, JASE, TWICK, YOUTH, NATE, BUTER, PEZ and VOGUE. For a while there I thought the legal wall on 19th and Mission was gone for good. Someone, new owners maybe, had buffed the outstanding BA Crew production with the Chor Boogie characters from 2005, and the blank green wall became a target for tags and throwies. But now it’s recovered some of its former glory with a who’s who of local greats, and even a Dream dedication by King157. Check it out! Yesterday I met a filmmaker named Dean Mermell, who shot several pieces of footage at one of my favorite walls back in 2002. I was able to reconstruct part of the wall from this video. This is just a rough stitch for now, but hopefully I’ll get my hands on some more detailed footage later! Best viewed at full size. Graffiti Archaeology in Archaeology Magazine! June 7, 2007 on 1:00 am | In events and press | Comments Off on Graffiti Archaeology in Archaeology Magazine! 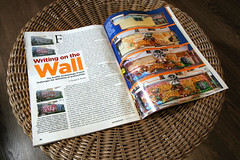 The July/August 2007 issue of Archaeology Magazine features a four-page article about Graffiti Archaeology. It’s by far the most thorough, in-depth article anyone has ever written about the project, with tons of images, and interviews with real archaeologists to get their take on it. I could not possibly be more proud. June 15 Update: The article is now online. Enjoy! Shown here: cove/eastZ 61, February 3, 2007. Piece by OPTIMIST, throwies by TWICK. Meanwhile, the increasing number of layers on certain walls (especially cove/eastZ with 61 of them) is continuing to call attention to new flaws in our Flash interface. This time, the bottleneck is the fact that before you see a single image, your browser has to download a set of outlines and solid shapes, one pair for each layer. It was never a problem initially, because the files are all very small– but it’s a problem now, because there are so many of them! We’ll need to change a few things to get around that, but I’m pretty sure of how to do it. Stay tuned.